The prize was presented on the International Human Rights Day, December 10. At Radio Liberty, Gorelik specialized in human rights reporting, but the new American management of RFE/RL cancelled her programs and those of other journalists whom they fired. Several other journalists resigned in protest and with their fired colleagues formed Radio Liberty in Exile. They launched their own website, LibertyNew.com. Nearly all major Russian human rights leaders and democratic political figures, including Mikhail Gorbachev, issued statements in support of the fired journalists. Some have also appealed to Secretary of State Hillary Clinton, the U.S. Congress and the Broadcasting Board of Governors (BBG), which oversees Radio Liberty, to overrule the mass dismissal of Radio Liberty journalists and other recent personnel and programming decisions made by RFE/RL president and CEO Steven Korn and his top deputies. In remarks to senior staff at the RFE/RL headquarters in Prague, Korn said that that he would not have been able to convince Russian human rights activists and political leaders of anything, including what day it was. The Moscow Helsinki Group, also known as the Moscow Helsinki Watch Group, (Московская Хельсинкская группа) is an influential human rights monitoring NGO which was established in the Soviet Union and still operates in today’s Russia. It is led by Lyudmila Alexeeva (Alexeyeva). 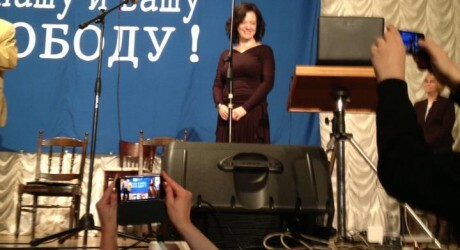 The last interview Kristina Gorelik recorded for Radio Liberty last September on the day she and other journalists were being fired was with Alexeeva. Gorelik and Alexeeva were inside the RFE/RL Moscow bureau recording the interview, while her colleagues were being prevented from entering the building by RFE/RL security guards. Later, Alexeeva told RFE/RL President and CEO Steven Korn that even repugnant wild capitalists in Russia treat their employees better than he had treated Radio Liberty journalists. But some of the fired journalists said they were humiliated by being fired in a law firm office in Moscow and prevented from returning to work, and one independent Russian journalist called Korn’s statement a mockery. The new Radio Free Europe/Radio Liberty management has been criticized for programming changes that de-emphasize news reporting and include posting of sexually suggestive videos. Republican BBG member Victor Ashe has publicly questioned Steven Korn’s leadership at RFE/RL. Ashe said that Korn made Radio Liberty an enemy of the human rights movement in Russia. Korn has reportedly also angered BBG Democratic member Michael Meehan by refusing to provide answers to the BBG Strategy and Budget Committee which Meehan chairs. Other BBG members, both Republicans and Democrats, are also deeply concerned by Korn’s actions, according to BBG Watch sources. The BBG’s next board meeting is scheduled for December 14. The RFE/RL board, which includes all BBG members, will also be meeting, at which time the issue of the fired Radio Liberty journalists may be discussed, sources told BBG Watch. In a letter sent to the Broadcasting Board of Governors last September, Kristina Gorelik described how she and her colleagues, including employees with disabilities and single mothers with dependent children, were fired by RFE/RL executives without any warning. Letter to the Broadcasting Board of Governors from fired Radio Liberty journalists Kristina Gorelik. On the morning of September 20th, RFE/RL’s corporate lawyers summed the entire staff of the Moscow bureau’s Internet division and informed them that they were no longer employed by the company. On the morning of September 21st, when the rest of the bureau’s staff came into the office, they were met by similar news. In one stroke, a collective that took over twenty years to assemble was destroyed. Out of 55 people employed by the bureau, 35 were fired. An additional 5 resigned in protest. There remain 15, of whom 4 are producers, 3 are technical staff, a secretary, a coordinator, an accountant, and an administrator. The whole of broadcasting and information services has been entrusted to just three individuals. I was lucky in that I was able to say farewell to my listeners who have followed my human rights programs for 10 years. The majority of fired journalists were not afforded such an opportunity. One by one, they were summoned, forced to sign off on their own dismissal, and given two hours to vacate the premises. Many of these people had worked at the bureau since its founding over 20 years ago. What did the Russian public get to hear about this? Not from most of us, chased away from the microphone, our computers, and our building by guards especially hired by RFE/RL managers for this purpose. My own opportunity to say good bye was pure luck. On the day I was fired, I was recording an interview with the famous human rights activist and founder of the Moscow Helsinki Group Ludmila Alekseeva. Owing solely to this circumstance did my program eventually air. Alekseeva saw first hand what was happening in the bureau, and soon a letter was drafted by ten of Russia’s most prominent human rights activists. They were outraged by the destruction of the Moscow bureau. Most importantly, no one knew at the time, and no one knows now what the real reasons behind this decision were. From a strictly legal standpoint, I have no qualms with RFE/RL’s management; I signed the papers I was asked to sign. But no one can silence my moral condemnation of what happened. I still have not heard a satisfactory explanation for why such an enormous percentage of our staff was fired, considering the fact that the BBG’s annual report named the Russian Language Service one of the best under its supervision. RFE/RL’s management has stated on a number of occasions that our future is in multimedia. Why, then, were the first people fired those who staff our Internet division – the people who brought coverage of the protests in Russia to hundreds of thousands of online users? The number of our website visitors and social network subscribers has been growing unabatedly, and these figures were part of the BBG’s annual report. RFE/RL’s management talked about convergence, but our journalists already wrote pieces for the station’s website, produced video materials, maintained personal pages and broadcast over the Internet. Many of them took the initiative and took multimedia training sessions in order to improve our mass-media outreach. Was this not a clear enough demonstration of our willingness and ability to adapt to new conditions? RFE/RL’s management also talked about cutting costs, but due to the timing of the dismissals — not wanting to see these loyal employees for even one more day or to allow them even to say good bye — the company was forced to pay out hefty severance packages. The Moscow bureau was provided with a new space: a new office was built and furnished with expensive equipment. Benefits packages for new employees were expanded and salaries increased significantly. Questions arose over the inexplicably high pay rise for the bureau chief, but this was never addressed. Nothing was done to economize in the aforementioned areas, and the Russian Language Service’s budget for the following year – even in light of recent spending – was not trimmed. RFE/RL’s management explained the current wave of layoffs by referring to a new strategy, but why were the details of this strategy never made public? Access to these documents might have explained why influential, seasoned journalists with excellent reputations, who had spent years reporting on sociopolitical issues in Russia, were suddenly deemed unfit for service? RFE/RL’s management additionally explained the layoffs by citing recently passed legislature that prohibits broadcasting in Russia by agencies whose funding is over 48% foreign. I won’t dwell on the argument that our broadcasts are necessary (there are plenty of advocates for this position), or that similar rules did not prevent the Radio from broadcasting before or that all other Western broadcasters in Russia had other arrangements and will continue to broadcast despite the new law. I will, however, point out that the new rules come into effect for us on November 10th. Why, then, was it necessary to lay off people with such urgency, and to burden the tiny remaining staff for at least a month if not much longer while we are being paid to do nothing and for not showing up? Is our presence, after 20 years of serving our audience, so distasteful to the new management that we can’t even say good bye and thank them for listening, visiting our website, calling and participating in our programs all these years? And finally, why did no one consider the reputational risks and damage that RFE/RL would incur by acting in such a fashion? People who have worked in the Moscow bureau have excellent reputations and considerable influence in Russian public circles. It is no accident that among those who spoke out against the recent layoffs were Mikhail Gorbachev, numerous human rights activists, opposition politicians, prominent public figures and journalists. Many of them have agreed that, in light of the recent crackdown on civil rights in Russia, Putin’s regime could not have asked for a greater gift. The American taxpayer seems to be rather confused regarding whose interests are really at stake in this situation. Kristina Gorelik is a journalist, member of Russia’s Union of Journalists, former human rights broadcaster at Radio Free Europe/Radio Liberty (RFE/RL) fired in September 2012, author of former Radio Liberty programs “The Third Sector,” “A Man has a Right,” and “The Path of Freedom,” winner of the Moscow Helsinki Group Journalism Prize. Andrei Babitsky is viewed as one of Radio Liberty’s most courageous reporters.